I’m a pretty analytical guy, and when I tackle questions like “what should we be looking out for?” I usually prefer a top down approach. So today let’s start with the big picture, 30,000 foot stuff: the economy and the financial markets. Then we’ll break down a few micro topics that could affect you more directly: taxes, healthcare, Social Security, and net neutrality. International trade is not so black and white. There are not clear winners and losers. Rather, everyone is better off when there’s open access to international trade. That’s the textbook explanation, at least. In today’s world we have to account for huge national debt levels and major currency wars across developed countries. I do think the U.S. can be taken advantage of in light of currency issues, but this “we win first” attitude is a little scary. It is important to put our country and economy first, but not at the expense of open international trade. This is a protectionist mentality, and in my opinion puts the global economy at risk. Mr. Trump is walking a fine line here, and how he proceeds with regard to NAFTA and other trade agreements is of much interest to me. As you know, the federal debt level is at an all time high, and rising fast. At the end of 2015 (the 2016 report isn’t out yet) the U.S. federal government owed a total of $18.1 trillion dollars. President Trump seems to be focused on reducing the debt level, but details on how that might happen haven’t yet emerged. 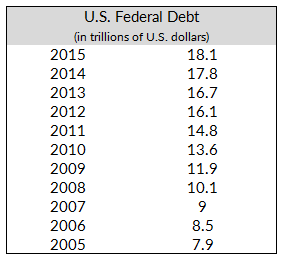 One metric that I pay attention to is the ratio of federal debt to our annual gross domestic product (GDP). Historically when countries owe more than 120% of their annual GDP, they start to run into trouble. At 120% of GDP governments typically have a hard time balancing debt service on outstanding notes (paying interest & principal, in other words) with their normal operating budget. It’s also the level where lenders start to get nervous about a government’s ability to pay their loans back down the road. Right now the U.S. has a debt level of just over 100% of GDP. The U.S. is in a unique position, though. Since the U.S. dollar is the world’s reserve currency our country has more flexibility than other developed countries. Even so, Mr. Trump’s ability to manage the federal debt level will affect not just our personal finances, but our kids and grandkids’ too. Many, many people across the world are concerned that president Trump is leading us down a dangerous path that will result in military conflict. His staunch views on immigration & trade both put our country at odds with some of our long term allies. If we continue to head down this path, there’s always the possibility that such disagreements escalate. Most all of us sincerely hope this doesn’t happen, but the fact is that it remains a possibility. It seems selfish to worry about how military conflict might impact our personal finances. Nonetheless, its important to watch. Both the bond and stock markets have signaled economic confidence since election day. Here are the themes I’m keeping an eye on. The S&P 500 is up 5.4% since election day. This isn’t an astronomical amount, but conveys that the market has confidence in the economic outlook and business climate. There’s no correlation between the performance of the stock market and which party wins the office of the president. What’s interesting to me about the beginning of 2017 is that the market seems to be insulated from Mr. Trump’s ultra-low approval ratings. Even though he’s so unpopular with his constituents, investors don’t seem to be fazed. Political and economic climates tend to influence business leaders & their decision making. When times are good and leaders see ample opportunity, they’re more comfortable taking risks & reinvesting in their companies. Also known as “animal spirits” in the investment management world, more entrepreneurial risk taking usually tends to boost our country’s economic output. There is a ton of controversy surrounding our new president (to say the least), and many business leaders have joined the outcry against his ban on immigration. But outside of the immigration policy, many CEOs, executives, and business owners have been clear that they’re excited about a more business friendly environment. Lower taxes and reduced regulations are normally good for corporate profits, the stock market, and ultimately the economy. Of course, their impact on the environment and other matters is another story. The yield on 10 year U.S. government bonds is often used as a barometer for the bond market. Since the U.S. government can simply print more money in order to repay its debts, there’s virtually no risk that our government would ever default on its bonds. (Of course, there’s always interest rate and inflation risk). 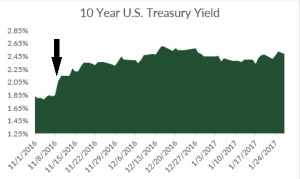 Yields on 10 year U.S. government bonds jumped immediately following the election. 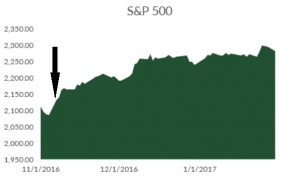 They’ve been on an upward trend since then as well, which reflects confidence in economic prospects under president Trump. Whereas short term interest rates are set by the Federal Reserve, longer term rates are based on the capital market’s economic expectations. When investors and businesses believe good times are ahead, rates tend to rise to higher levels, and vice versa. Based on the trend in yield, the bond market thinks good economic times are ahead. Remember that any time interest rates rise, there’s downward pressure on bond prices. This concept is known as duration risk. If we expect further increases in rates, you’ll want to make sure you’re accounting for the impact that might have on your portfolio. Now that we’ve addressed the high level stuff, let’s focus on what could directly affect you & your family. There’s a lot of uncertainty whenever you speculate how a new president’s policies might impact your finances, of course. Anything can happen. Even so, here are a few things to pay attention to. Again, there’s no telling whether his proposed plan will actually become law. But rest assured, there is a tax cut coming. For planning purposes, that means you’ll want to delay income or capital gains as much as you can. One of President Trump’s first executive orders once taking office was to begin repealing the Affordable Care Act. 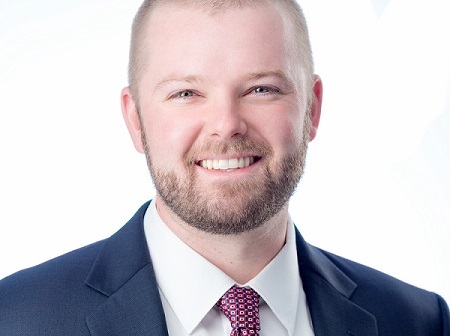 He and other republicans claim that their replacement plan includes incentives to use health savings accounts, as well as provisions to purchase insurance across state lines. The republicans have not been transparent about the details of their plan, though. The fact remains that health insurance premiums are rising an average of 24%, according to recent reports. On its surface, expanded ability to contribute to health savings accounts and inter-state competition between insurance companies is wonderful. Whether that will put a dent in the pace of cost increases is anyone’s guess. Whatever the result, the cost of healthcare remains a major issue – especially for those without access to group plans. Trump has claimed several times that he doesn’t want to touch Social Security. That said, the Social Security is only funded enough to pay 100% of promised benefits until 2034. After that the tax receipts at the time will be enough to pay 75% of promised benefits. This has many current & soon to be retirees up in arms. I won’t rehash all the details here, since I covered Social Security reform in a recent post. Make sure to check it out if you’re concerned about what might happen to the program. Net neutrality is the concept that internet service providers should allow universal access to all content posted on the internet. There’s been a big argument over the last several years surrounding whether the internet should be viewed as a utility, or a consumer product in our country. Under Barack Obama, the FCC imposed regulations enforcing net neutrality. Currently service providers are not allowed to favor or block specific content – they must grant users access to the same content at the same speeds – just like a utility. President Trump hasn’t been open about his views on net neutrality. He has however appointed Ajit Pai to be chairman of the FCC. Pai has been vocal in his criticisms of net neutrality regulations. And while he may not overtly repeal current rules, he can easily choose not to enforce them. Without net neutrality, expect varied speeds & service levels at different price points. Whereas you might currently pay a flat rate for unlimited access at a set speed, without net neutrality you might need to pay up for the same level of service. Or use the internet under less user friendly terms. Technologyreview.com has a more thorough review of what might happen if net neutrality goes away. Right now there’s a ton of uncertainty surrounding most of these issues. This is just my two cents on what to keep an eye on, as all of the topics above could impact your financial situation. I’ll try to include updates on these topics in future posts. For now, feel free to reach out if you have any questions. 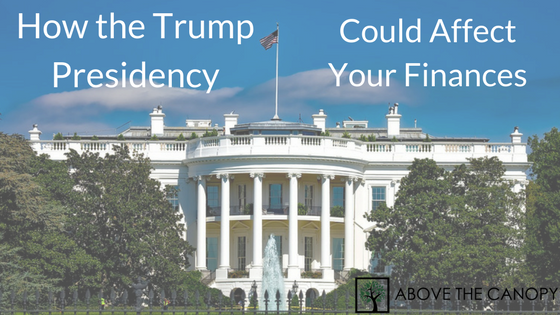 Posted in Financial Planning, Investing, Retirement and tagged how Trump could affect your personal finances, how will Trump affect your finances.